Here is a good checklist for family camping ! 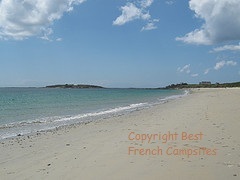 Here is a link to a list of the blue flag beaches in France. The blue flag is awarded based on water quality, information displayed, cleanliness of the beach, toilet facilities etc in addition there must be some environmental education linked to the beach. It does surprise me to see that some of my favourite beaches aren’t listed. Also, some of the supposedly “great beaches for young children” arent listed which is disappointing. If you havent decided which campsite to stay at yet the list of blue flagged beaches might help you. What do you think about the beaches listed ? Have you found a beach which seemed really nice or one that wasn’t so great ? We were slightly disappointed with the beaches at Trinite Sur Mer last year. I was a bit suspicious about the amount of green seaweed which had to be removed all the time in the early mornings – I wondered if this might be a sign of pollution and the water wasnt always all that clear. The only place that has so far tempted me in for a swim was the beach at the St Cast le Chatelet campsite on the north of the Brittany coast. If your French language abilities arent great and you would like to see a film in English then look for films which were originally filmed in English and which are marked VO for Original Version. It may be that towards the High season you may get more of these sorts of films in cinemas in tourist areas. New strike dates announced. 18th – 22nd May, 24th May, 30th May and 5th June. So further travel disruption for air travellers in addition to the volcanic ash problems. I hope its not going to affect your holiday travel plans.